Every item has a birth, and a death. Maybe that's the way everything is on Planet Earth. Now, the life of an item is messy. Undeserving items receive disproportionate attention, and consequently, perform above their pay grade. Highly deserving items are ignored, literally dying from starvation. And as anybody knows, when a Management change happens, items die and items are born. The key, of course, is to identify "peak life". For so many companies I work with, the curve looks something like what is depicted in the bar chart above. Often, items show significant promise, from the get-go. That promise is capitalized on ... the cataloger gives the item catalog space ... the online marketer features the item on landing pages and on the home page and in email campaigns. The secret is to measure what happens after sales begin to decline. This relationship is different for each business. I have clients that are selling items from the 1990s - and the sales curve has yet to decline. I also have clients where the life cycle is measured in weeks/months instead of years. I like to look at items that are in the top 5% for demand volume and/or item volume. These items typically make up 50% of your annual sales volume. Only a handful of items ... a ton of responsibility from these items! 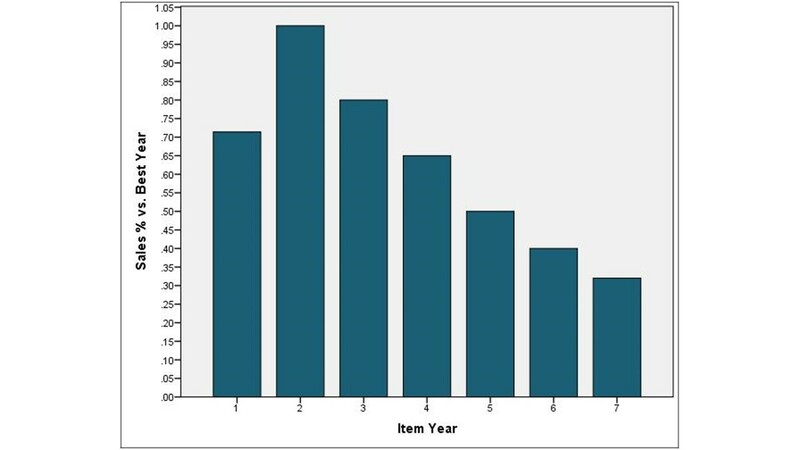 Anyway, measure where your items are on the life cycle curve above. If you notice that, year-over-year, your best selling items are increasingly aging, well, you know you have a real problem that you have to address.